At the forefront of Halsey Street lies MH302 Marco Hall Boutique. Before entering, you can’t help but notice the boutique’s display window… a few mannequins dressed in designs created by Marco Hall himself and a larger than life size image of Marco Hall. Newark native, Marco Hall is a designer of ready to wear and couture clothing for both men and women. 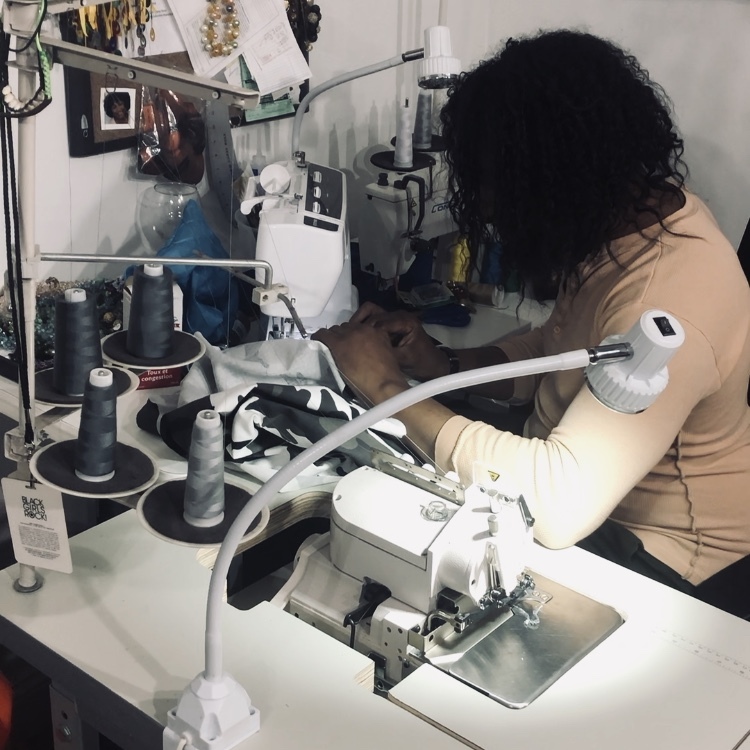 Marco Hall is a staple in the fashion industry; he has provided clothing for some of the world’s most famous stars such as Rihanna and Whoopi Goldberg. His boutique is unlike anything featured in Newark. His boutique features a fun inviting atmosphere, an imaginative display of Marco’s looks and an inspiring fitting and work space. From my perspective Marco’s boutique incorporates art, peace of mind, couture fashion, and innovative without ever feeling out of place from Newark. In fact, it is a perfect ode to Newark’s rugged history, it’s colorful people and their inventive culture. Check out Marco designs in all shapes and sizes and price points! Come lose yourself in silhouettes inspired by colorful prints, good spirits and energy. What made you fall in love with fashion? Marco: I never wanted to be like anyone, I always enjoyed being different from an early age. Fashion definitely chose me, and it grew into my passion. What was the hardest obstacle for you getting started? Marco: I don’t know if any of it was difficult. I just always did me, staying true to my brand and who I am as a person, and designer… people saw this and embraced it. If I had to give advice to all upstart fashion designers from my experience, please stay consistent. Before you can make a product, you must know who you are, what your brand is and who your target is. After building a consistent clientele is vital. What does a typical day for you as a business owner? Marco: A typical day for me starts as soon as I walk into my shop. I always check my messages and emails to catch up with any clients/potential clients. I then make a mental checklist of what I need to get done for the day albeit designs, customer sit-ins, etc… I then cut and sew until I have to meet with scheduled clientele. When I have time in the day I always take a trip to New York to pick fabrics. The rest of the day is simple go back to cut & sewing and in-between take meetings with clients. I have a modest schedule. As for the business it runs through my schedule. I’m the only one here running the store. Marco: As for designing there are no challenges. As for the business, I would say one challenge is definitely being able to cover business overhead “all the expenses it takes to run a business.” Many of the overhead costs can’t be avoided. I need things like electricity, internet, and office space in order to operate. The challenge is making sure at the end of the month when these expenses are equated I’ve made a profit. What does your clothing have in common with Newark? Marco: Newark is a very “ride or die” place. The people here love their city and have no problems telling someone that Newark is the greatest place on earth. I’m very “ride or die for my clothing.” It’s what I stand for. It’s forever a part of me. Why is it important for you to own a fashion business here in Newark, NJ? Marco: It has always been a dream of mine to own a business. Newark just happens to be the place where I honed my skills. Newark has always been good to me, why not come back and share what I have to offer with the city. I believe Newark is a thriving city where the locals must remain at the forefront. I still have so much to offer and I know the people of this city want me here. What do you think of the Newark Makerhoods mission? Marco: Newark Makerhoods is what Newark needs. There’s a lot of talent floating throughout the city. Lots of entrepreneurs need guidance on how to scope their business. The community aspect of Newark Makerhoods is what sold me; a place where creatives can grow together and seek help together is amazing! Marco: When you’re in this, you work hard… you continue to learn… you’re always open to grow. Stay true to you, your beliefs, your passion and beliefs. Never let anyone try to break you or crush your dreams.